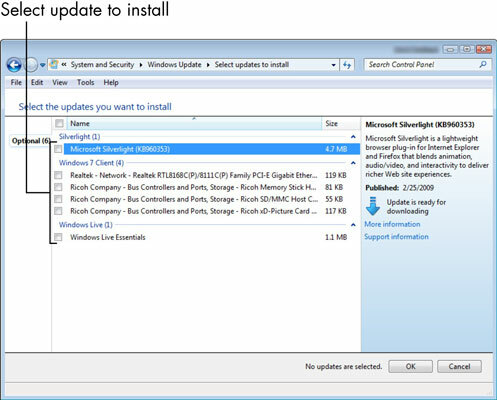 Running Windows Update either automatically or manually on a regular basis ensures that you get the latest security updates to the operating system, so it’s a good idea to play it safe and stay current. You can set up Windows Update to run at the same time every day. Click the Change Settings link in the Windows Update window and choose the frequency (such as every day) and time of day to check for and install updates. Choose Start→All Programs→Windows Update. In the Windows Update window, click Check for Updates. 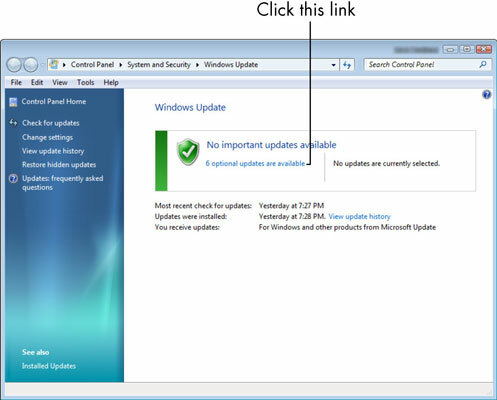 In the resulting window, click the Updates Are Available link to see all optional or important updates link. The following window shows the available updates. Click to select available critical or optional updates that you want to install and then click the OK button. A new window shows the progress of your installation. When the installation is complete, you may get a message telling you that it’s a good idea to restart your computer to complete the installation.